In my opinion there are as many ways to keep chameleons, as there are different chameleon species and keepers. Every time I go somewhere I see new and more practical methods for keeping these amazing animals. In the last 2 years alone I have had the chance to view chameleons in, Madagascar, South Africa, and Tanzania, not to mention different areas of the USA and Great Britain. While in these places I couldn't help but be amazed by the adaptability of the chameleons and the ingenuity of their keepers. Of the many ways I have seen to house chameleons, there are two methods that I feel have special merits, even for those of us who keep them indoors for months on end. The two basic types of enclosures I encountered on my travels were outdoor screen caging and variations of pit cages. We all know about the chameleon's need for ventilation. Screened enclosures are most certainly one of the best ways to achieve this goal. 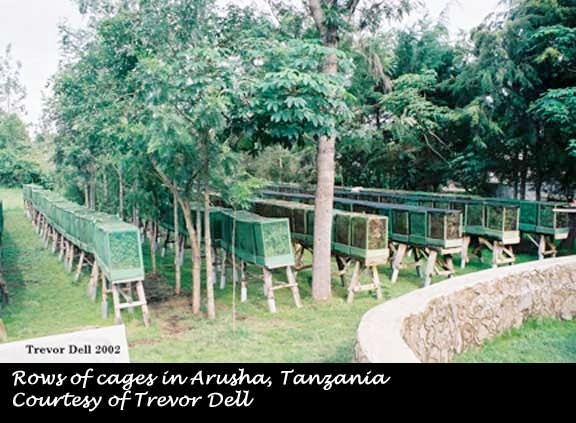 While in Tanzania and visiting Joe Beraducci I saw his cages in person and noticed a number of useful methods he uses to house his chameleons. The first difference to the usual sterile, indoor-screened enclosure was the bottom of the cages. Joe has incorporated the use of a base of approximately 6 inches of soil in which the plants are planted. This gives the plants a permanent home and the chameleons a suitable place to lay at any time they are ready. For smaller chameleons such as Rhampholeon species as well as Bradypodion spinosum, this is a very useful advantage. 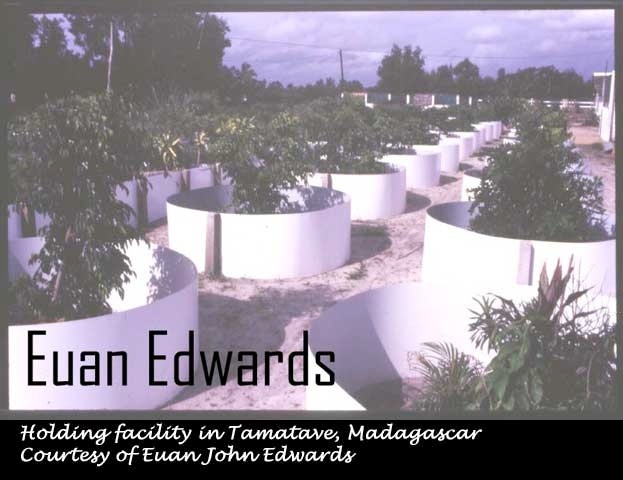 Being situated in Arusha, Tanzania, Joe has the advantage of living in a chameleon friendly climate where the chameleons, their eggs and plants can survive all year round in outdoor cages. Joe also has some interesting techniques for keeping the temperatures in the appropriate range for his chameleons. One more of the interesting ways Joe keeps his chameleons happy is by positioning his cages from east to west according to the sun. This is done so that the sun never hits the cages full on for long. As the sun rises the cages shade one another until midday when the sun is right above, and as it sets the cages once again protect each other from the heat of the sun. Joe also uses shade cloth on top of those cages, which get more of the sun than others or are used to keep cooler loving chameleons. 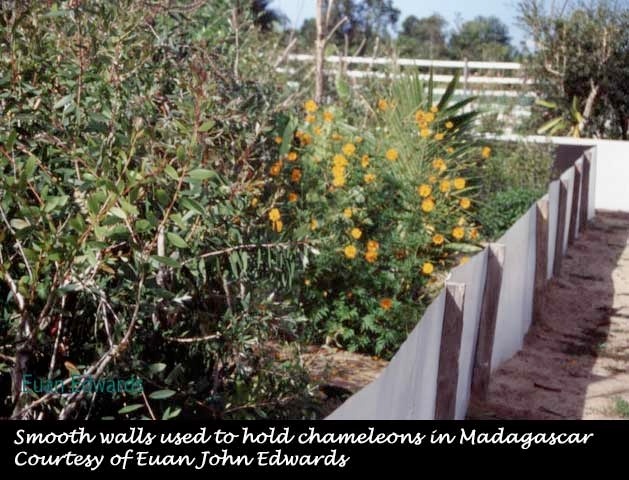 In Madagascar at Mandraka, I came across some screen cages, which were fitted with thatch roofs. These gave excellent shelter from the mid-day sun, especially for the species that could not take extreme heat. Obviously the roof would stop any rain from getting through although most keepers have access to a sprinkling system of some sort. "This is very nice and all," I hear you say, "but how does that help me in the Northern Hemisphere where keeping chameleons outside year round is not an option?" Let me offer some ideas. Firstly, since some of us are forced to move our cages inside on colder nights and winter months, I think if you design your own cage in the right way you could use Joe's ideas to your benefit. By making a cage with a deeper base I think planting your plants in the base layer of soil can be used to help with those tricky little egg layers and their finicky laying needs. This would mean that a laying container is always available although more diligence must be used if one would like to incubate the eggs oneself. The one big problem with this idea is how to keep the soil from flooding during spraying. This problem can be easily taken care of by providing adequate drainage and by layering the substrate with larger stones at the bottom, smaller stones on top of those and then adding sand, and finally soil. This should allow the soil to drain without washing away and without drowning any eggs that you may not have discovered. The second type of caging I commonly encountered is the wall/pit type enclosure. The premise is pretty simple; just make sure the chameleons can't get out using a steep smooth wall of some kind. The most common pit cage consists of a brick wall built around some bushes in a circular or rectangular shape, plastered and painted. 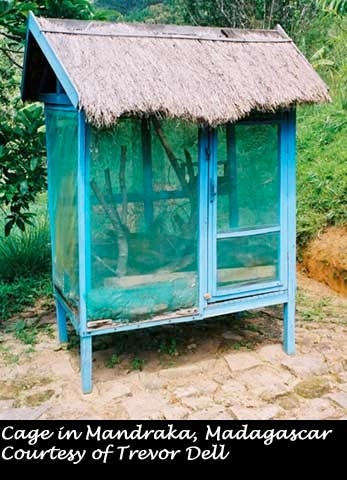 These type of cages can be found anywhere in the world where the weather is favorable enough. I have seen some variations on this old technique that I believe could make life interesting for both the chameleons and their keepers. This method provides a great way to provide natural light and food, and provides great visibility. The aesthetics of this method can make this a nice alternative to the usual mesh cages. 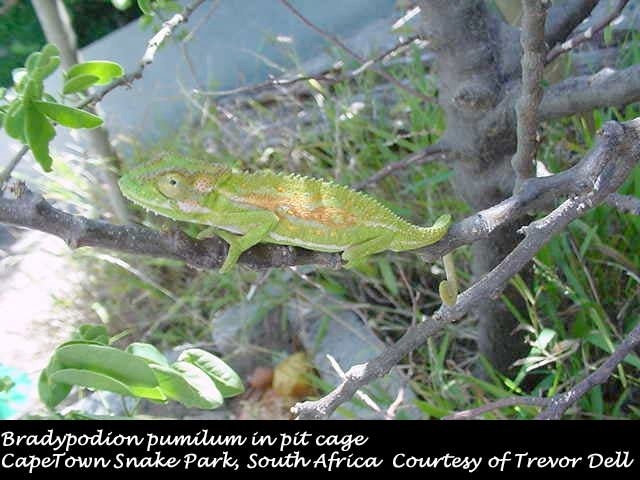 The disadvantages however include danger from predators, and escaping chameleons if the cage is not designed and maintained properly. One advantage of pit cages is that you have access to wild food for your animals if you lure them properly. By using fruit (not meat) as bait, many wild insects will congregate right in the bottom of the cage where your chameleons can get the benefit from them. This of course would depend on how much you like flies and other insects around, and also whether there are a lot of pesticides being used in your area. The other advantage of pit cages is that the viewing is of course superb. Seeing the animals doing their thing without anything obstructing you vision is as good as it gets. 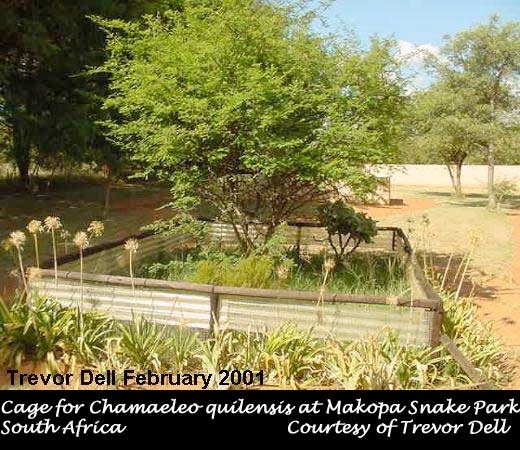 This benefit can only be enjoyed however if your chameleon's safety can be assured as domestic animals as well as local wildlife can wreck havoc on your collection in such a set-up. The accessibility of your chameleons is a great advantage as you can see, feed, and catch them without having to move all the plants and branches around like in a traditional screen cage. The only hindrances to your access would include the height of the plants used as well as the length of the grass. Keeping the grass short and the plants well trimmed can assure you of no escapes and easier access. 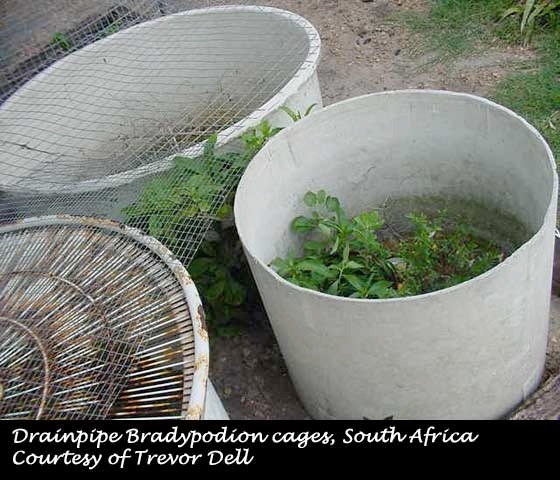 One last example of this method was seen at Bryan Vorster's personal residence for Bradypodion thamnobates, Bradypodion melanocephalum, and Bradypodion setaroi. This design included a large amount of simplicity and practicality. Bryan used large diameter cement storm water drainage pipes positioned on their side with some gauze for the roof. 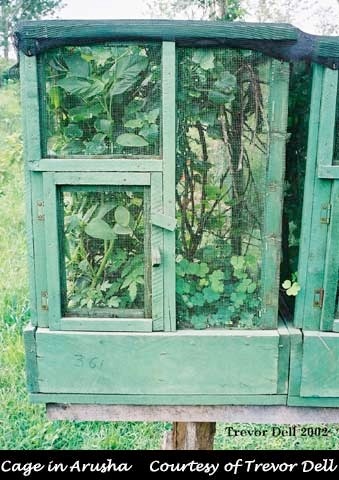 He provided some shade with the creepers and branches inside these simple cages. Pit cages are also great looking and practical ways of keeping indoors. There are many different ways to make this type of cage that include sweater boxes, entire rooms, or anything in-between. All that stands in you way is your imagination and the amount of money you'd like to spend. Lighting, drainage and watering, plus security, are important considerations so a great deal of care must be taken when setting up your cage initially. The lighting problem can be dealt with by using all the usual methods of providing light, heat, and uv requirements for your chameleons. Obviously the animals need to be kept away from harm, so caution should be used when designing your lighting set-up. Some thought, however, needs to be put into how you set up your lights as there are no roofs to lay the light on. Stands, walls, ceilings, and even cables can be used to set up your chameleons' lights. An added bonus to this type of cage involves the size and, therefore, the type of lighting that can be used. Metal Halide lighting would be ideal for this type of cage as the cage is bigger and can handle higher wattages, plus there would be no need to worry about heating of the mesh or cage material like you would in a traditional screen cage. The plants would thrive under these lights as well. Drainage is a constant headache for most people who keep chameleons indoors, but I think with some further ingenuity and a little effort a practical and visually pleasing cage can be designed without breaking the bank. Some examples could include using shower stall bases, or the entire stall with a small low door in front to facilitate viewing without sacrificing security. Tarpaulins, fiberglass or plastic are also useful materials, which can also be used to waterproof floors and guide water into drains or containers for dumping later. Self-priming pumps can remove waste water automatically. The options are as numerous as your imagination will allow. Although these pit cages prevent your chameleons from hurting themselves and should be secure there are always external factors to consider. There should be less danger indoors, however it always pays to be careful so make sure your cats, ferrets, dogs and other assorted pets can't get to your chameleons and vice versa. I trust you enjoy designing and building interesting and comfortable cages your chameleons like as much as I do and I hope you can use one or more of my ideas to your benefit in the near furniture. I would like to thank all the countless people who have shared ideas and photos with me, as well as all the keepers who have allowed me to see their animals and setups for myself. To all these people I want to say thank you very much.